In Foundations, you and your little one will eexperience relaxed, stress free learning through lap bounces, singing, instrument playing, and dancing. This special time carved out of your day creates critically important early bonding time between you and child. You will learn about your baby’s early development, how to fine-tune her baby-communication skills, and receive expert advice and parenting resources based on the most recent research in early childhood development. Through all the musical activities you will love that you are helping your baby’s brain receive a total full-brain workout! Welcome to this magic time of life, this all-too-fleeting first chapter of life when miracles happen daily! "Best program in town to enhance my children's music experience. Both my children have particpated since infancy." "Kindermusik is absolutely amazing for child intellectual, emotional, and social development. My twins blossomed in many ways, and I believe that the effects of their premature birth have been mitigated by their participation. They love interacting with other children, and have met many milestones by observing others. I have cherished the time that I get to spend with them. Getting to know other parents is also a plus! As a clinical psychologist, I know the importance of early childhood stimulation, and Kindermusik provides the various brain stimulation that children need to thrive! I recommend Kindermusik to everyone invested in their child's future." 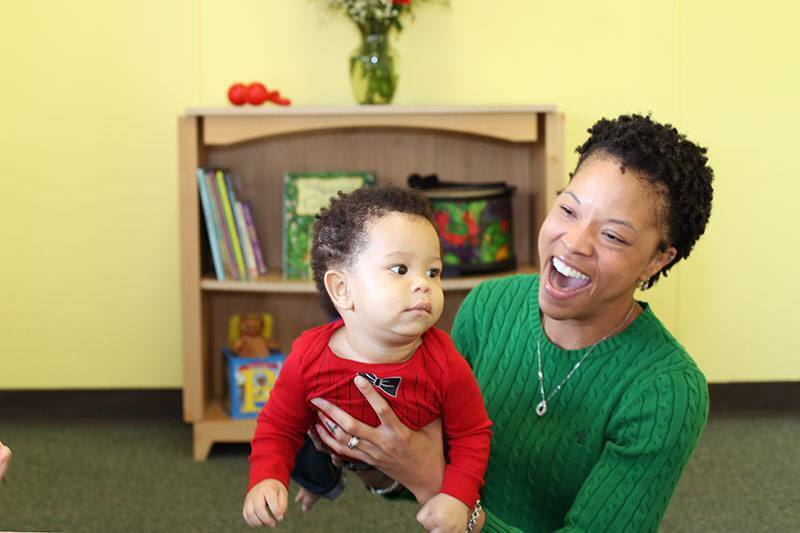 What will my baby and I experience in Kindermusik class? 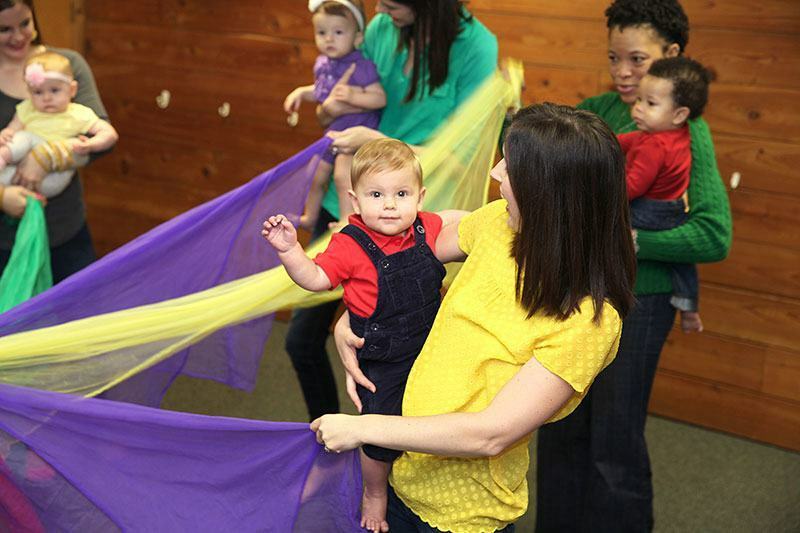 Musical diversity builds strong neural connections in a baby’s forming mind, which is why each Kindermusik units contain an array of styles, sounds, and genres. Age-appropriate experiences with child-safe instruments enhance a sense of rhythm and steady beat, develops a keen awareness of the distinguishing qualities of sound, and encourages spontaneity and creativity. A classroom full of baby and adult pairs dancing together helps a little body develop the muscle strength needed to crawl and walk and helps a little heart to fall in love with the sheer joy of responding to music. A Kindermusik class is truly the essence of “quality time,” offering the parent a place to create special memories with their child, gain new insights into their child’s development, and nurture their child’s natural love of music. A Kindermusik Educator explains “what-to-watch-for” every step of the way and how each activity enhances a child’s complete development. With the home materials, the learning continues at home with the child’s best teacher—the parent! "Ms. Shirley and the Kindermusik staff are amazing! We have been participating in Kindermusik since my son was 3 months old. Activities are all developmentally appropriate and easily adaptable for children of all ages and abilities. And it is also a great way for parents to meet others with children of a similar age. We will definitely be continuing Kindermusik for the years to come!" Simply click Register next to the class time that is most convenient for you. Registration fee of $25.00 will be charged at the time of enrollment. Tuition is charged on the first of each month.